It seems everyone has been all atwitter over the opening of the first U.S. Space NK, a British apothecary chain, for two primary reasons. The first is that people--okay, retail industry folk--are curious to see what kind of impact it has on Sephora's business, especially since Space NK is planning an aggressive nationwide expansion. I don't think Sephora need worry--while there is some product overlap, the two stores are completely different, from the stores' physical size and layout to their respective philosophies and ideologies. If anything, Space NK is more similar to Bigelow Apothecary--the spinoff Bigelows as interpreted by the Limited Inc. and found in upscale malls such as Water Tower Place in Chicago and Copley Place in Boston, not the actual Bigelow on Sixth Avenue. But Space NK is pretty unique, which brings us to the second reason why everyone is so excited about it: The store is simply awesome. Space NK is home to a number of high-end skincare, makeup, and haircare lines, many of them U.S. exclusives, such as Eve Lom and Zelens. There are familiar brands--Frederic Fekkai, Laura Mercier, and Dr. Brandt among them--as well as harder-to-find cult lines like By Terry makeup and Christophe Robin haircare. 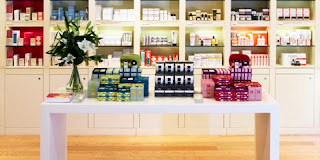 The store is bright, airy, and uncluttered, and it's organized by skincare, fragrance, haircare, etc. I found the in-house line of bath and body products particularly intriguing; the scents are named things like "laughter" and "soulful," and while they all smell lovely, I found "compelling" the most, er, compelling. While you can spend a lot of time browsing the store on your own, I found that, unlike Sephora, it helps to have a salesperson assisting you, if only because so many of the products are new and unfamiliar. After being assailed by a saleswoman whose idea of customer service was to spew too much technical information about anti-aging ingredients at me, I found a much more mellow shopgirl named Bianca, who helped me pick out a new lipstick from Poppy King's cult Lipstick Queen line. She also managed to sell me on the most expensive lip balm I've ever bought (Darphin, $25) and entertain me with a story about how their stock guy was trying to hook her up with the store's consultant (and, in a very Legally Blonde-like development, the consultant slipped Bianca his digits as she was ringing me up). I also walked out with a sample for a Darphin anti-aging serum, which so far has done nothing for my fine lines but at least makes my skin very soft--and I will admit that I'm a sucker for samples, so I am always a fan of stores with liberal sample policies. So while Sephora is a great one-stop shop for all manner of beauty products, Space NK is a much more luxurious experience, from the serene environment to the products themselves, which are more well edited. There's also something to be said for the level of service; Bianca told me to come back anytime and she'd do my makeup. Of course, I'm not sure that my wallet can handle another shopping binge at the moment, but when I'm in need of my next beauty indulgence, I'm going straight to Space NK. After all, I need to find out what happened with the consultant. Thanks for the review of the new Space NK store. Glad the store lives up to the hype!